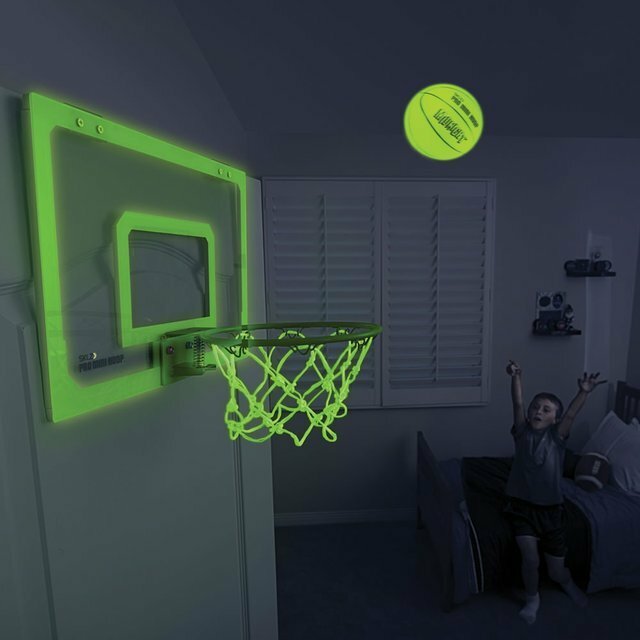 This Glow In The Dark Basketball Hoop is perfect for an indoor game of basketball. Featuring a mini-basketball hoop, it sports a spring loaded rim like the real thing, just on a smaller scale. The 1/4 scale backboard trim and net are white during the daytime or a lit room, but give off a green glow in the dark. The included 5 inch basketball is green, but glows in the dark when the lights are off. These luminescent items can provide hours of fun with tournaments, horse, or shooting drills. The backboard is constructed from shatterproof polycarbonate with a patented 9 inch breakaway hoop for withstanding even the best dunks. The sound dampening material on the back of the board minimizes noise from the ball striking the rim and backboard. The two metal mounts slip over most doors or cubicle walls and are reinforced with foam padding to protect finishes or fabric.